With the names of the two young boys unknown to the rescuers or White Star Line, they were simply called “Louis and Lola” and their photo distributed in Europe. 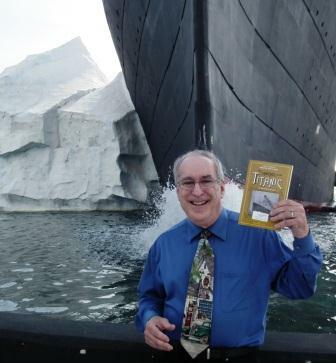 Bruce Caplan’s book, The Sinking of The Titanic has sold more than 150,000 copies. When the Titanic sank on the morning of April 15, 1912, of the over 2,200 passengers, 705 managed to survive in the rickety lifeboats. 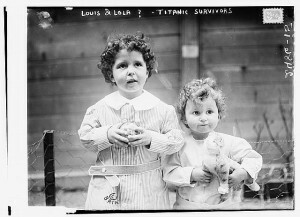 Two of the survivors were four year Michel Navratil and his two year old brother Edmond. The young Titanic passengers did not realize it, but their father Michel Navratil Sr. was illegally transporting them to America to keep them away from their mother who was previously allowed full custody of the children in a pending divorce procedure. The Navratil’s were traveling under the surname of Hoffman. As the Titanic was going down the children’s father Michel Naratil Sr. made sure that they were secured in a lifeboat. The father went down with the ship and because of his false Jewish surname of Hoffman, when his body was found , he was buried in the Jewish Titanic Cemetery in Halifax. The two Navatil children were soon reunited with their mother in France. Michel Navatil, married in 1933 and eventually became a college philosophy professor. He lived a long and happy life and in 1987 for the 75th anniversary of the Titanic Tragedy, he returned to America for the ceremonies. He died on January, 30, 2001, the very last male Titanic survivor. He was 92 years old! Louis and Lolo, orphans of the Titanic — or so it was believed until their mother saw the photo. This entry was posted in Titanic dead, Titanic Survivors and tagged Bruce M Caplan, Edmund Navratil, Louis & Lola, Michel Marcel Navratil, Michel Navatil, Michel Navratil Sr, RMS Titanic, The Sinking of The Titanic on July 29, 2014 by kenrossignol.